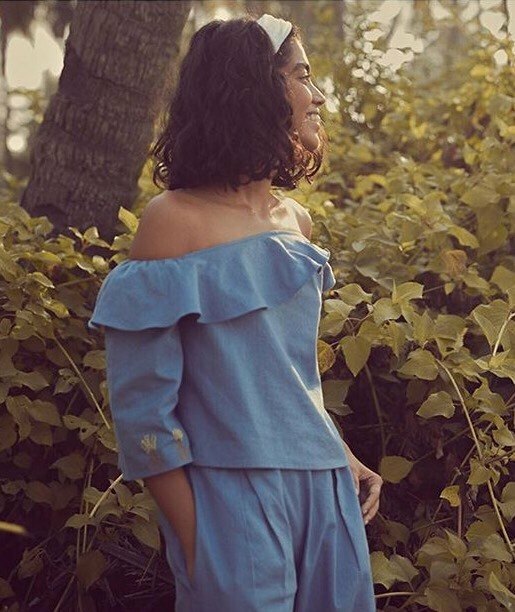 Mansi Shah of Hemp Fabric Lab tells us about sustainable fashion and hemp in India. Although hemp was legalized in 1985, the industry is still growing. Recently, we got in touch with Mansi Shah of Hemp Fabric Lab, to learn more about hemp in India. 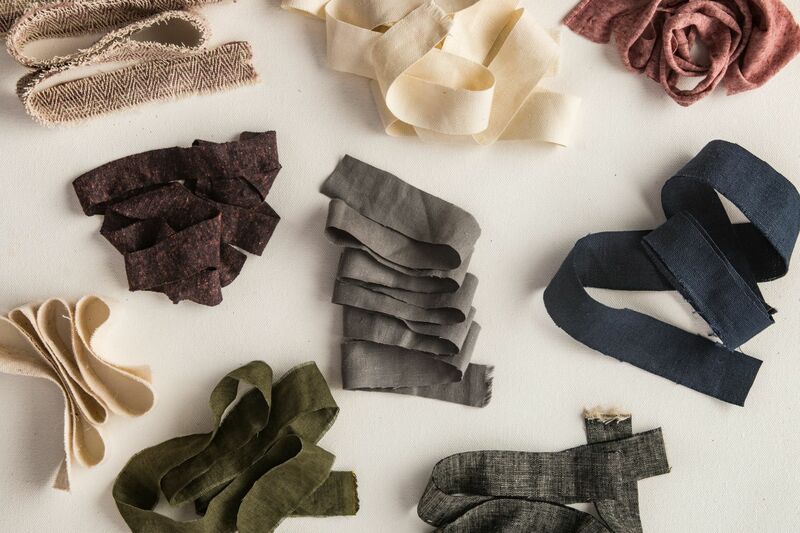 Hemp Fabric Lab makes innovative textiles that are either 100 percent hemp or blend hemp with fabrics like organic cotton, Tencel, silk, and wool. As hemp activists, we’re always striving to make things better where we are. Often keeping our focal points on concerns of our country and what we can do within our local communities. Similar efforts are being made across the globe. Considering hemp grows naturally in India, it comes as no surprise this resource has been used for generations. But what about the modern hemp industry? Numerous designers have already incorporated Hemp Fabric Lab into their work. 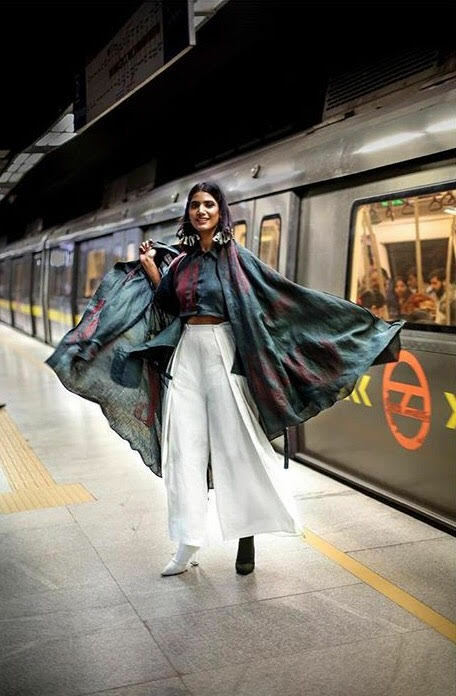 Image courtesy Mies Studio by Seerat Virdi, created for India’s first Circular Design Challenge organized by Lakmé Fashion Week, Reliance and UN Environment. A growing number of agriculture training programs and practices are spreading across farming communities to spread knowledge of hemp. Similar to the guidelines set by the Farm Bill in the U.S., India’s goal is for all hemp grown contain less than 0.3 percent THC. According to Hemp Today, investers recently poured around $150 million USD into the Indian Industrial Hemp Association. 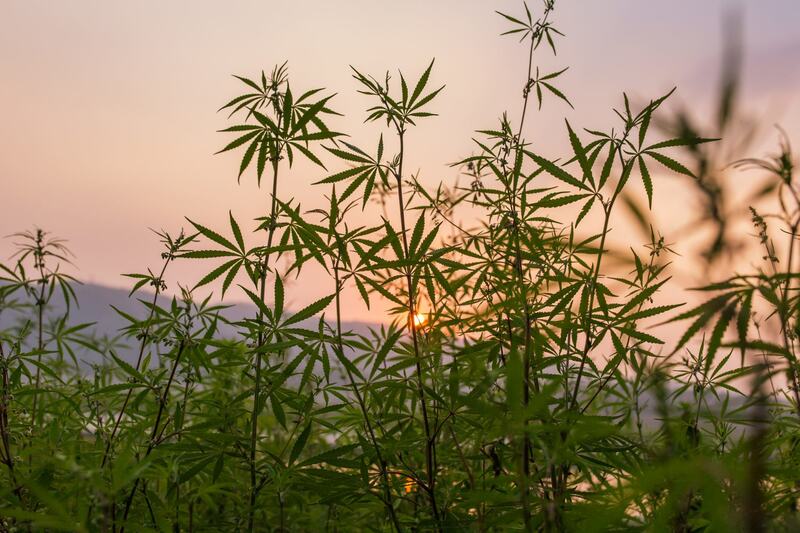 Not only is the IIHA hoping to expand on this booming global industry, but they’re also seeking to incorporate more native Indian hemp strains. Unfortunately, most wild hemp in India contains above 0.3 percent THC. Therefore, the association is seeking to raise the federal limit to 1.5 percent THC. It’s interesting to note that the county’s laws surrounding hemp have been looser than that of America’s for the past few decades. After centuries of use before prohibition, hemp in India was re-legalized in 1985. Still, there remains strict guidelines in accordance to the federal government. So much so, only two states in India — Uttarakhand and Uttar Pradesh — have developed an official set of policies governing the research and cultivation of hemp. Of course, these efforts can be seen as similar to America’s recent hemp accomplishments. However, the biggest difference is India’s been able to grow hemp legally since 1985, as long as all laws are followed. It’s due to this and efforts made by IIHA which have allowed for India to explore the different products hemp can create. According to HomeGrown, successful Indian hemp companies include foods and drinks and, of course, fabrics for clothing. In some ways, hemp in India seems more diverse than the ever-growing CBD market here in America. Yet, the interesting aspect of all this is India’s demand for hemp didn’t grow until recent years. 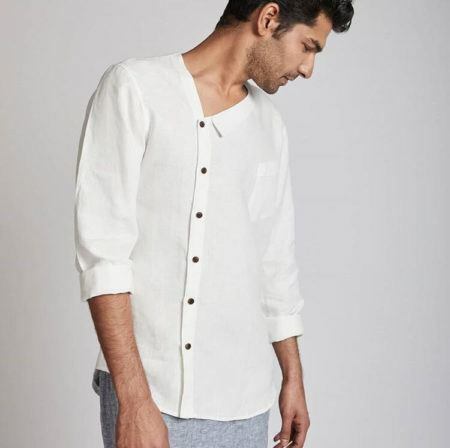 White hemp shirt by India’s first hemp-based fashion brand, BLabel. Brands and designers of all sizes are exploring hemp fabric in India. Hemp Fabric Lab came into the picture when they noticed the Indian textile industry lacked easy access to natural fabrics. With that came a demand for sustainable fashion. However, unlike other fabric companies, Hemp Fabric Lab offers customers the option to purchase a few meters of fabric. They did not want to force individual creators and small companies into minimum order quantities. These kind of sales not only allow for other companies to develop their own sense of fashion, but for the fashion industry as a whole to start incorporating hemp. These problems range anywhere from an overdependence on intensive commercial crops (such as cotton and sugarcane) to socio-economic factors causing people to leave the countryside and move into the cities. In turn, these leaves rural parts of India ultimately unproductive. Yet, through all the complications, Shah and her team believe hemp can be a solution to India’s agriculture. Hemp’s ever-growing popularity in India is noteworthy. As is happening across the world, there’s a demand for organic materials and foods. India is no exception and many have been seeking out hemp’s eco-friendly material. Hemp Fabric Lab allows artisans and small companies to order small amounts of hemp fabric, helping to promote hemp’s acceptance in fashion at every level. Image courtesy Sui Mue, a sustainable fashion brand based out of New Delhi, India. One of the greatest ways to promote hemp is by allowing hemp to have an influence over the fashion industry. This is the final goal of Hemp Fabric Lab which we discussed. This cooperation Hemp Fabric Lab and BOHECO have found hopes to develop clothing which will make its way amongst the masses. Their main target is people between the ages of 21 and 50 with a focus on clean, easy-to-wear silhouettes that will allow people for easy, on-the-go clothing. As Shah mentioned, the hemp industry in India is still just coming into existence. With that, everyone involved has a lot of work to do. Not only in growing this industry, but also in teaching the rest of the world the many benefits of hemp. As the hemp industry booms, it will inevitably product more waste. We looked at two startups recycling hemp and cannabis waste into useful products. In a world of increasing pollution, two startups are trailblazing new techniques to reduce waste by recycling hemp. 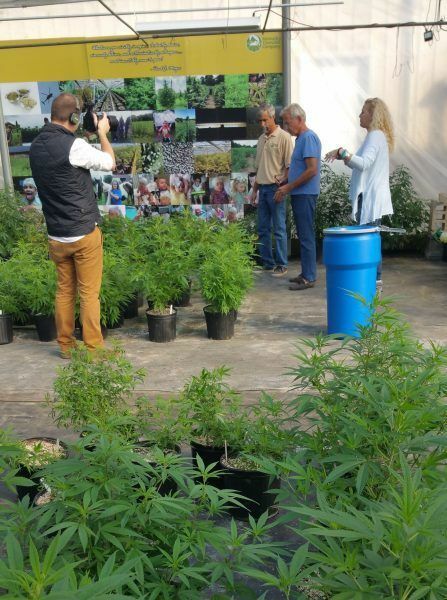 The community based around hemp is famous for its holistic approach to life. Hemp advocates care about living cleanly, reducing their environmental impact, and trying to reduce waste as much as possible. 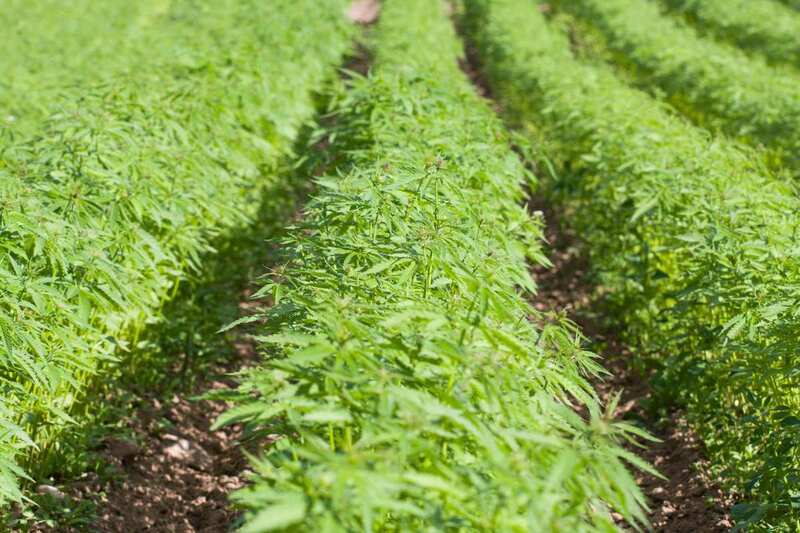 Industrial hemp is now fully legal in the United States thanks to the 2018 Farm Bill. As a result, we can expect the hemp industry to grow and produce more waste. Companies like 9Fiber and Kindness 3D see this as an opportunity. Previously, we reported on Sana Packaging, who use hemp to create sustainable packaging for the recreational cannabis industry. 9Fiber and Kindness 3D differ in that they’re recycling hemp and cannabis waste after it’s produced. They’re helping reduce pollution and helping their fellow human beings at the same time. 9Fiber, based out of Silver Spring, Maryland are an agricultural technology company focused on recycling hemp stalk and stem waste. This startup takes hemp bio-waste that’s been put aside by other companies and processes it into raw materials that can be used to make a variety of products. First, 9Fiber decontaminates any biowaste from federally illegal substances, removing the THC. Next, they process the waste further by removing fiber from the hurd, which is the woody core of the hemp plant. Then, the fiber undergoes final processing before it becomes usable for production. 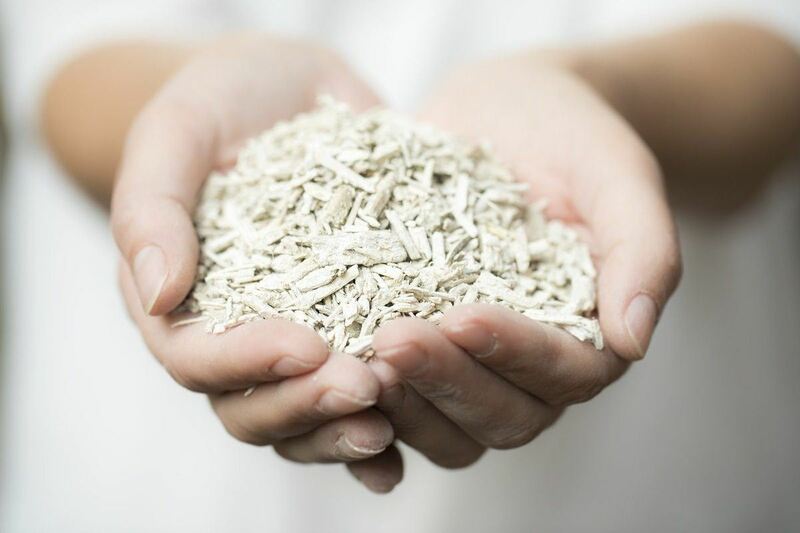 With the recycled fiber and gum-free hurd, 9Fiber is able to make paper, rope, textiles, fuel, bioplastics, fiberglass, hempcrete, and even livestock bedding. In November, the Colorado Advanced Industries Accelerator Grant Program gave 9Fiber a $250,000 grant. The process to get the grant was a lengthy one, as many startups. With this new funding, 9Fiber plans to expand their operations into Pueblo, Colorado in late 2019. Hopefully, this grant can also help 9Fiber scale with the inevitable boom in hemp production. With the recent passing of the 2018 Farm Bill, 9Fiber’s future is looking bright. 9Fiber is recycling hemp by separating out the hemp fibers and woody core (hemp hurd). After processing, 9Fiber can reuse these materials in hemp plastic, hempcrete, animal bedding and more. 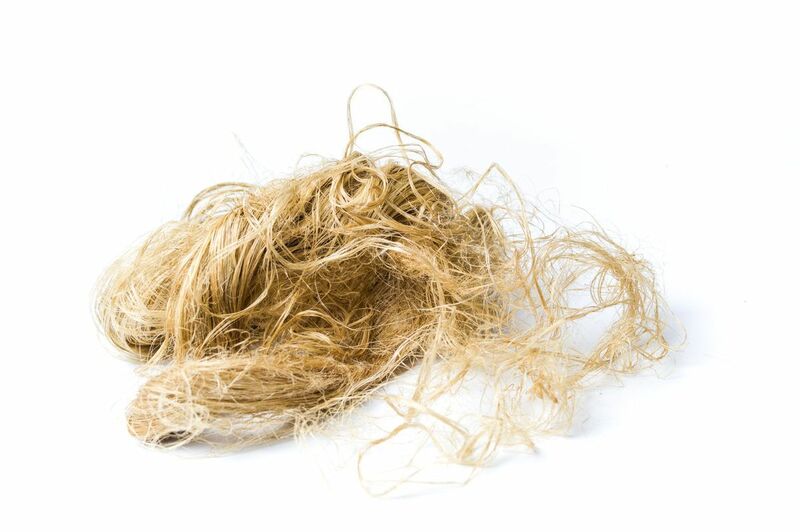 While the hemp industry inevitably produces waste, companies like 9Fiber can use that waste to produce other products. Not only is Mr. Alai passionate about his startup, but he believes that the cannabis industry has the potential to be a leading zero-waste industry. Meanwhile, up north in Nova Scotia, Canada, a prosthetic limb production company recycles plastic waste from local psychoactive cannabis (“marijuana”) shops. After Canada legalized recreational use of marijuana, there has been a dramatic increase in plastic container waste. Based out of Halifax, Kindness 3D turns plastic packaging from psychoactive cannabis products into prosthetic limbs. 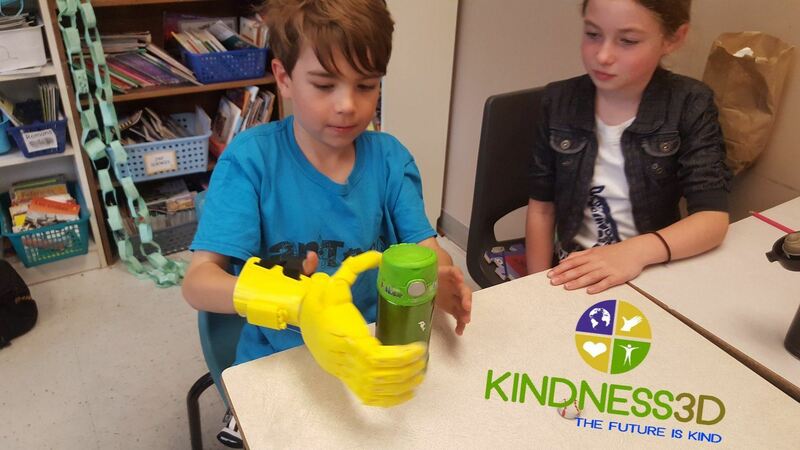 Starting as a 3D printing enthusiast, Jake Boudreau started Kindness 3D after coming across templates for prosthetic limbs in an online 3D printing community. Since the creation of the non-profit, he’s been able to send hands to a girl in Costa Rica and a woman in Brazil. He aims to not only recycle reusable plastic waste, but to help people who can’t afford the expenses that come along with prosthetic limbs. Donate to Boudreau’s GoFundMe and check out the Kindness3D Facebook page! As industrial hemp and cannabis legalization spreads around the world, companies like 9Fiber and Kindness 3D fill an important niche. Efforts like these are vital for reducing hemp waste, and to increase the utility of the hemp plant. Hopefully, recycling hemp will become commonplace, and recycled hemp biomass products can become part of our everyday lives. Hemp’s future is green, in more ways than one. Among hemp products, demand for CBD oil has exploded in recent years. Unlike THC or marijuana, CBD won’t make you feel high. Thousands of people report CBD helps them relax, relieves pain and anxiety, promotes deeper sleep, and much more. Ministry of Hemp is America’s leading hemp advocate. We’ll help you understand the science of hemp & CBD and pick the right products. But the CBD industry is still unregulated. Products can be misleadingly labeled, contain toxic heavy metals or dangerous synthetic chemicals. New consumers often give up before they find products that work. That’s where we come in. Ministry of Hemp is America’s leading hemp advocate. We help you understand the science of CBD and review CBD brands so you can pick the best, safest products for you and your loved ones. 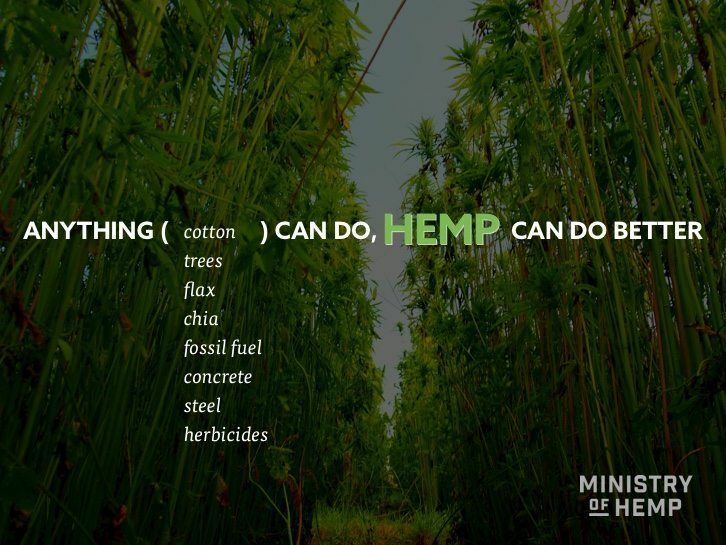 As hemp growing returns nationwide, you can count on Ministry of Hemp to be there. From Vermont hemp farms to hemp research on the International Space Station, we’ll bring you the story. Be a part of our movement. Join the Ministry of Hemp. After legalization, hemp biofuel could be a key part of reducing our dependence on fossil fuels. Researchers have made hemp into two types of biofuel: biodiesel and ethanol. After legalization, hemp biofuel could be a key part of reducing our dependence on fossil fuels. Fuel is everything. America would not be the hyper-efficient economy it is today without something to power our cars, computers, and our Roomba vacuum cleaners. We would be nothing but Neolithic farmers without our electricity and gasoline. But, anything that is truly valuable always comes at a price. Traditional fuel sources hurt the environment, and they’re running out. Air pollution from processing fossil fuels harms the troposphere, and indirectly depletes ozone from our atmosphere. The price for hyper efficiency is evident, which is why alternative fuel sources are becoming so important. Today we focus on a fuel source that hits close to home. That alternative is hemp biofuel. A biodisel fuel pump at a filling station. Biodiesel is one very appealing option for hemp biofuel. The cannabis plant is the gift that keeps on givin’. This magic plant gives us CBD oil, THC, hemp fibers and even fuel! Researchers have made hemp into two types of biofuel: biodiesel and ethanol. Biodiesel is produced by the pressing of hemp seeds to extract their oils & fats. After the extraction, the product is then put through more steps to make it into a usable hemp biofuel for your car. If you’re curious to learn about the specifics of biodiesel production, the process is thoroughly explained by hemp.com. The argument for hemp-derived biodiesel comes down to convenience. 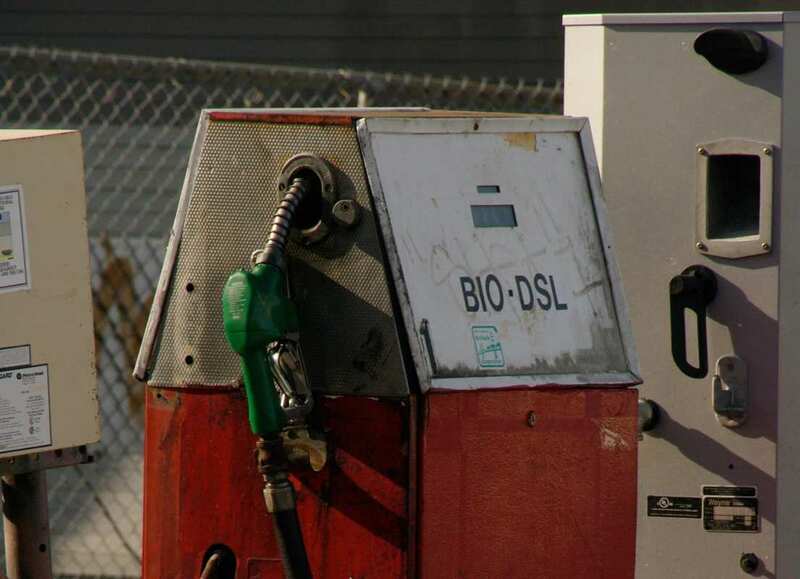 If processed correctly, biodiesel can be put into any diesel-powered automobiles. It can be stored and transported like diesel, so there isn’t a need to create a new system for transportation. It even replaces the smell of traditional diesel with the smell of hemp. Ethanol is traditionally made from wheat-based crops such as corn and barley. It’s traditionally used as an additive to gasoline, which gave way to our “flex-fuel” vehicles of today. Hemp can be made into ethanol by various forms of fermentation. Using hemp as the main source of ethanol, instead of food crops like wheat & corn has clear advantages. Not using food crops as a fuel source allows more efficiency in food production, and hemp can be grown in lower quality conditions unlike corn or wheat. 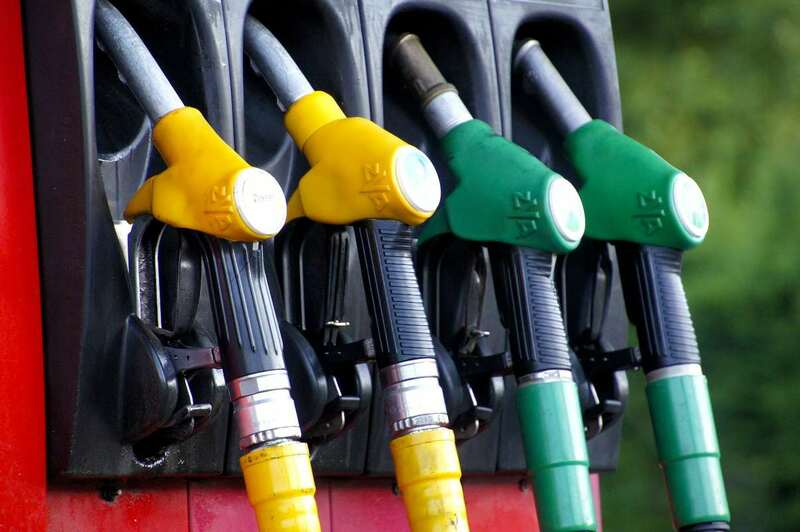 Hemp-derived ethanol also shares the advantages of transportation and usability as biodiesel. A row of yellow and green fuel pumps. Hemp biofuel could present more sustainable alternatives to fossil fuels in the near future. Fuel alternatives like this can seem like a no-brainer to replace our traditional fossil-fuel sources, but there are drawbacks to these alternative techniques. To set up a large-scale industrial hemp farm, you will experience the same ethical dilemmas that the farming industry faces. Deforestation and pesticide use will increase, and we’ll inevitably replace some of our food-crop land with more hemp-crop land. Farmers can grow hemp biofuel on land that is not fit for other crops. This “marginal land” is essentially land that isn’t tilled and cleared out for farming. Despite the versatility, hemp produces a much bigger harvest in ideal farming settings. Additionally, marginal land is actually home to important plants, trees, and living creatures that are vital to the ecosystem. Read “Is Hemp The Best Biofuel?” from sensiseeds.comfor a more in-depth look into the argument for hemp biofuel. Clearly, hemp biofuel alone won’t solve our environmental crisis, but we believe it could be part of a transition to a cleaner way of living. While hemp biofuel may not be a popular ralternative just yet, the automotive industry already uses hemp. Automakers weave hemp plastic into a bendable material similar to fiberglass. Almost all European car makers use hemp fibers as interior door panels and trim pieces. And companies like FlexForm technologies operate as a dedicated producer of hemp-fiberglass that they sell to automotive companies to be made into car doors and exterior panels. Cars that feature hemp-based materials include the BMW i8 supercar and the Lotus Evora. The advantages that come with hemp-made materials is that they are lighter, bio-degradable, and comes from a much easier renewable resource. Hemp grows in roughly 3 months while metals take thousands of years to form. Thanks to continued bipartisan support for hemp legalization paired with a culture that is growing increasingly accepting of the cannabis plant, we’re witnessing the beginning of hemp revolution. While hemp biofuel can’t solve the entire energy crisis (we believe the answer to that problem will require multiple solutions), it can provide us with a great renewable fuel source in addition to it’s already useful applications. While we spent our time here discussing hemp biofuel, let’s not forget the other ways people have been using hemp. There’s hemp beer, hemp blankets, and, this reporter’s personal favorite, hemp food! The future is indeed green. More and more people are asking themselves, “should I grow hemp?” The secret truth to hemp’s growing popularity is it’s one of the easiest, most versatile and most sustainable crops you can grow. Across America, we’re witnessing an ever-growing market for industrial hemp. Only two years ago, there were less than 10,000 acres growing across the country. Today, this new cash crop has reached an astounding 27,000 acres. And that number continues to rise. This comes as no surprise considering hemp’s wide variety of uses. Even beyond the industry, many small farmers are finding ways in which hemp benefits their lives. The simple answer, you get more out of it than you put in and the crop can grow in some inhospitable conditions. However, as you’ll find out from reading, the real reasons go deeper than that. The secret truth to hemp’s growing popularity is it’s one of the easiest and most sustainable crops you can grow. Unlike major cash crops such as corn or wheat, hemp grows in dense clusters that require very little pesticide or herbicides and a minimal amount of fertilizer. It requires less water than some cash crops like cotton, though it isn’t considered a low water crop. 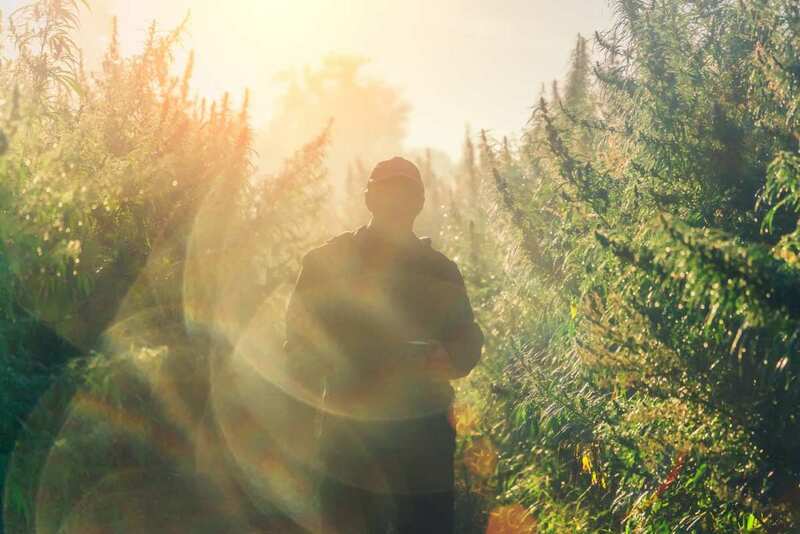 A hemp farmer surveys his crop at sunrise. Why grow hemp? Farmers grow hemp because it requires little maintenance and offers many uses. You can grow hemp almost anywhere in the country, excluding very dry deserts and high mountaintops. Preferably, hemp prospers in well-drained soil that has a high quality of organic matter. This guide from HempTechGlobal offers more detail on the logistics of growing and harvesting hemp. One potential complication is decortication, in which the parts of the hemp plant are separated. Decortication can require access to specialized equipment. Research has discovered growing hemp holds potential to heal polluted soil. With the possibility to replace fossil fuels and be a new source of paper, hemp is considered one of the most eco-friendly crops around. In fact, there are over 25,000 known uses for hemp. Whether you’re looking for something as complex as a form of concrete (hempcrete) or something as simple as some pet bedding, hemp has you covered. People’s health also benefits from access to hemp. Hemp is a superfood that provides a great source of nutrients and fibers. But even better, it’s the key ingredient in CBD oil, an amazingly beneficial nutritional supplement. When it comes to why people grow hemp, whether it be for personal or industrial use, there are a wide variety of reasons to consider. Many farmers report it’s an incredibly rewarding crop to grow. One of the biggest questions people have when deciding to grow hemp is about legality. In most people’s minds, it’s still very much attached to its still federally illegal cousin, psychoactive cannabis (‘marijuana‘), making many farmers all the more cautious. In 2013, Colorado farmer Ryan Loflin revolutionized the country by being the first to harvest hemp in America since 1957. Since then, the 2014 Farm Bill allowed states to pursue hemp farming for the sake of research practices. Since then, 38 states have legalized hemp cultivation. Because each state operates differently under the bill, it’ll be necessary you do some research before planting any hemp crops. There are some legal factors you’ll need to keep in mind before starting your hemp garden. The first and most important is you’ll be required to have a license. One which requires a fee and lots of paperwork. In some cases, you may face a criminal background check. Furthermore, after harvest, your plants must be tested for their THC levels. If they test higher than .3 percent, your crop will most likely be destroyed. Industrial hemp grows in long, tightly packed rows on a farm. While there are large-scale uses for hemp, many smaller farms also grow hemp. Some hemp farmers, such as Kim Phillips from Montana, run into unexpected difficulties. Her water source is federally regulated by the Bureau of Reclamation, so she had to request access to their assets for hemp irrigation. Since they didn’t approve her request in time, her plants withered the first time she tried to grow hemp. Because hemp plants are required to have such a low amount of THC, many farmers find the most difficult task is finding the proper seed. Since hemp legality is so recent, the seed industry can’t always keep up with the ever-growing demand for seeds. There have also been reported difficulties shipping seeds through states where hemp production is still illegal. Even with everything that’s been mentioned, the demand for this eco-friendly crop is enormous. Many farmers are jumping on the hemp bandwagon. You may still wonder if it’s beneficial for you to grow it for personal reasons. The truth of the matter is, the legal standpoint on hemp may turn some growers off. But, if you can look past those obligations, hemp can be of great use to you. As already mentioned, there’s such a wide variety of ways in which hemp can be used for your personal benefit. Even more so, though, by deciding to grow hemp, you can be a part of creating a more sustainable way of life. Every industry is struggling with the growing problem of waste. Both medical and recreational dispensaries depend on plastic and foil containers which are used once, then thrown away. We met with two pioneering companies creating sustainable hemp-based alternatives. While hemp plastic is still being perfected, companies like Sana Packaging are already creating composites from hemp and corn. Sana Packaging’s products are created using hemp hurd, the fibrous woody core of agricultural hemp, then combined with corn to create composite bioplastic. A Sana Packaging tube designed for use in the legal cannabis industry. This “doob tube” is made from a combination of hemp and corn. Hemp packaging can be part of reducing dependence on single-use, unsustainable packaging. Working with domestically-sourced materials also ensures the sustainability of their products. Hemp.Press also targets the cannabis industry with products that replace boxes or display cards made from trees with hemp paper. The companies are also involved in lobbying to change cannabis laws. Currently, most states with legal medical or recreational marijuana programs prohibit the re-use of packaging at cannabis dispensaries. If those laws changed, consumers would be able to bring their hemp packaging back to the dispensary to be refilled with fresh flower, extract, or pre-rolled cannabis joints. Growing interest in a lesser known building material could create healthy homes all over America. It’s called hempcrete and it’s durable, sustainable and carbon negative. Growing interest in a lesser known building material could create healthy homes all over America. It’s called hempcrete. This combination of chopped hemp shiv and lime binder is durable, sustainable and carbon negative. 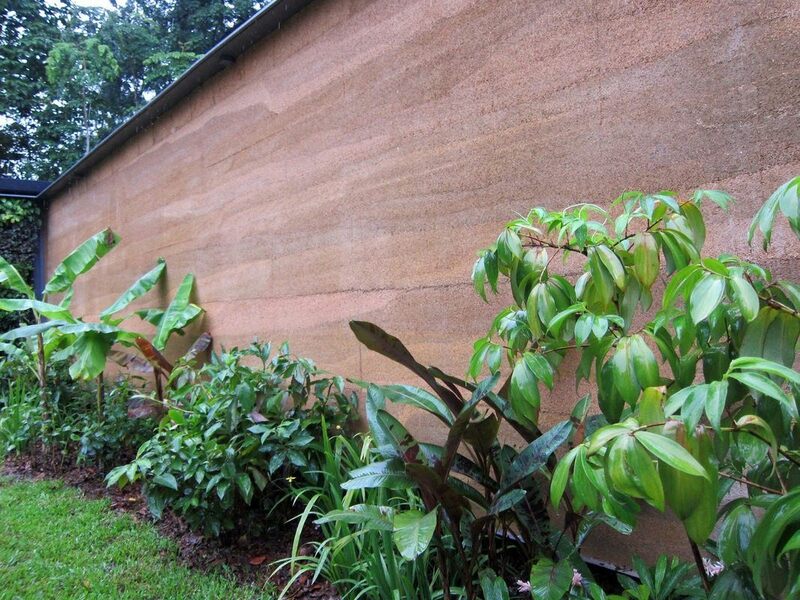 Lime is an abundant quarried material and hemp is a renewable biomaterial — both safeguarding the sustainable future of hempcrete and our planet. HOW DOES HEMPCRETE PROMOTE HEALTHY HOMES? Hempcrete is a breathable matter, absorbing moisture from the air when humidity is high and releasing it again when humidity levels drop. This ensures that water vapour can pass in and out of the wall rather than becoming trapped and causing damp problems. When cooking or in bedrooms at night from the occupants breathing, there is often excess moisture in the air. Hempcrete absorbs this moisture into the walls to be released later, discouraging damp. This in turn combats the formation of fungi and mold spores which are damaging to human health. The regulation of humidity has been shown to inhibit the spread of viral and bacterial infections, allergic reactions and respiratory conditions. This ability to regulate air quality reduces the need for powered air filters and ventilation systems, allowing for truly healthy homes. WHAT ABOUT HEMPCRETE AND PEST CONTROL? Hemp is naturally fire-retardant and pest-resistant. Because of these properties, there is no need to add the chemicals which are usually added to building materials, including formaldehyde and volatile organic compounds (VOCs). Formaldehyde is a known carcinogen and VOCs have been implicated in both asthma and allergies. The omission of these chemicals obviously contributes to the health of the occupants of the house. A pair of hands holding dried, shredded hemp shivs, which look a bit like wood chips. They are ready to be mixed with lime and water and formed into blocks. Hempcrete can be used to build new healthy homes or add an extension to your existing home, perhaps a “granny annexe” allowing elderly parents to move in with their children in a healthy environment or a “relaxation room” for family members to unwind and breathe deeply. HEALTHY HOMES AND HEMPCRETE: WILL THE BENEFITS WEAR OUT? Hempcrete is an incredible material which has negative carbon emissions. This means that it absorbs more carbon dioxide than is produced by building it. Even in this form, when hempcrete has consumed more carbon dioxide than it has left in the atmosphere, it remains breathable, so homes continue to be rainproof but remainpermeable to gas and moisture in the environment. Hempcrete homes will stay healthy for life. What with the growth of green building, interest in healthy homes and and widespread need for sustainable building materials, hempcrete is set to be the home building material of the future. Did you know there’s a building material that’s durable, sustainable, healthier for the occupants and even carbon negative?It’s called hempcrete, a composite made from fibers of the industrial hemp plant mixed with lime. In 2009, Hemp Technologies oversaw the first permitted hemp home build in North America, in North Carolina. However, hemp’s uncertain legal status sent Flavall to New Zealand, where the crop was legal to grow for use in building materials. He’s traveled the world helping create hempcrete structures ever since, working on everything from jungle cabanas to wine tasting rooms. Now that hemp is becoming popular in the U.S., demand for his services is skyrocketing here too. We recently caught up with Flavall to learn more about why hempcrete is better than other green building materials, and to hear about one of his most recent projects, a home retrofit which could soon be part of an upcoming TV show on hempcrete homes. Agricultural hemp is the close cousin of psychoactive cannabis or “marijuana” (the plant people consume to get high). While marijuana is prized for its flowery tops, hemp is grown for its tall, fibrous, leafy stalks which are a little bit similar to bamboo. 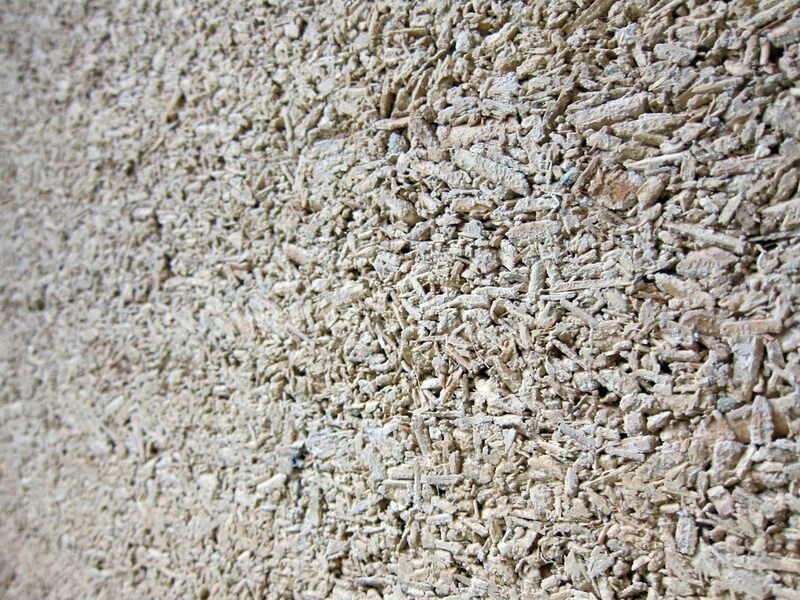 Hempcrete is made from hemp shivs, which are the fibrous, woody core of those stalks, also known as the hurd. The shivs are chopped up into chips, which are mixed with water and a lime binder to form concrete-like stone slabs that have a pleasant, earthy appearance that many people find appealing. Hemp is a more sustainable option than many other commonly grown crops, because it requires very few pesticides and can easily be grown in very dense plots. But the benefits don’t stop there, especially when it comes to hempcrete homes. “We have seen, anecdotally, reductions in healthcare cost and absenteeism because of living in a hemp building,” Flavall said. Like many aspects of hemp science, more research will be needed to prove how significant a health benefit hempcrete can have for its occupants, but Flavall’s claims make sense when you consider the many documented beneficial characteristics of the material. Much like the original hemp plant, hempcrete is known to be extremely pest resistant. It’s also extremely durable and fire resistant, which is especially important when Flavall builds in environments like New Zealand, where both rain and seismic tremors are extremely frequent. As hempcrete dries, it absorbs the carbon dioxide produced by the occupants and grows harder, essentially turning to stone. Not only does this make the building stronger, but it makes hempcrete into a carbon-negative building material by leaving less of the greenhouse gas in the atmosphere than is produced by building with it. Even in this form, hempcrete remains “breathable” — homes remain rain proof but permeable to gases and moisture are less prone to mold and better for the overall health of their occupants. According to Flavall’s calculations, hempcrete buildings in the U.S. remain carbon neutral even though most of the hemp used in current building projects must be imported from overseas. It’s also a surprisingly affordable option: he said it meets or beats other common building materials in up-front costs when used properly, in addition to incredible savings on heating and cooling costs over the lifetime of the building. “At the end of the day when you turn the key to move into your new home you’re at the same price as regular construction,” Flavall said. “Our hempcrete project began with a passion for natural building,” Stacey Petersen told us. 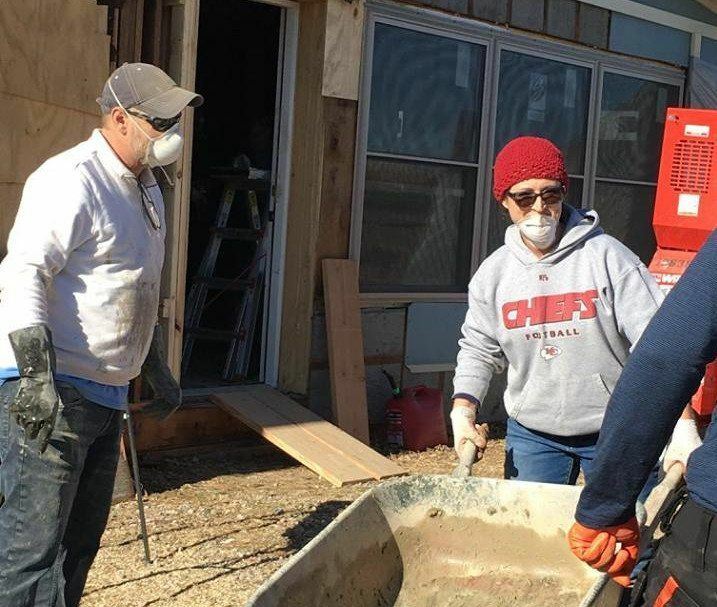 Greg Flavall (left) with Stacey Petersen holding a wheelbarrow, during the hempcrete retrofit of the Petersen’s home in Missouri. Building with hempcrete was so easy, everyone could help out. (Photo: Facebook / HT Global Hemp House Build TV Series, used with permission). After other sustainable building fans tipped her off to their work, Greg Flavall and Hemp Technologies led a major hempcrete retrofit of the Petersen family’s home, located in Excelsior Springs, Missouri, in December 2017. The simplicity of working with hempcrete allowed everyone, even family friends, to participate in the building process. Stacey’s husband, Jon Petersen, is the Pastor of Ministries at Desperation Church In Liberty, Missouri, and their embrace of the hemp is another sign that the stigma around this misunderstood crop is disappearing. Not only are they already planning their next hemp project using leftover supplies (“a greenhouse or a mother-in-law cottage,” Petersen told us), but they also use CBD oil, an extract of industrial hemp, to ease symptoms of severe epilepsy in their 10-year old son, Jeriah. A growing body of research suggests CBD oil helps kids with epilepsy, and that’s been true for Jeriah as well. While not a miracle cure — he still suffers from severe seizures that sometimes land him in the hospita l– the supplement seems to reduce the number of seizures. Perhaps even more importantly, Stacey Petersen believes it helped the family wean Jeriah off a potentially dangerous medication which was actually making his symptoms worse. The Petersens are continuing to use CBD as Jeriah explores other forms of treatment, and his illness also inspired their interest in hempcrete. Since Jeriah uses a wheelchair, the Petersens swapped their previous multi-story home for single-story 1960s house of about 2300 square feet. “My son, obviously he has a lot of challenges so we need healthiest living environment possible for him,” Stacey Petersen said when I asked her about the appeal of hempcrete. 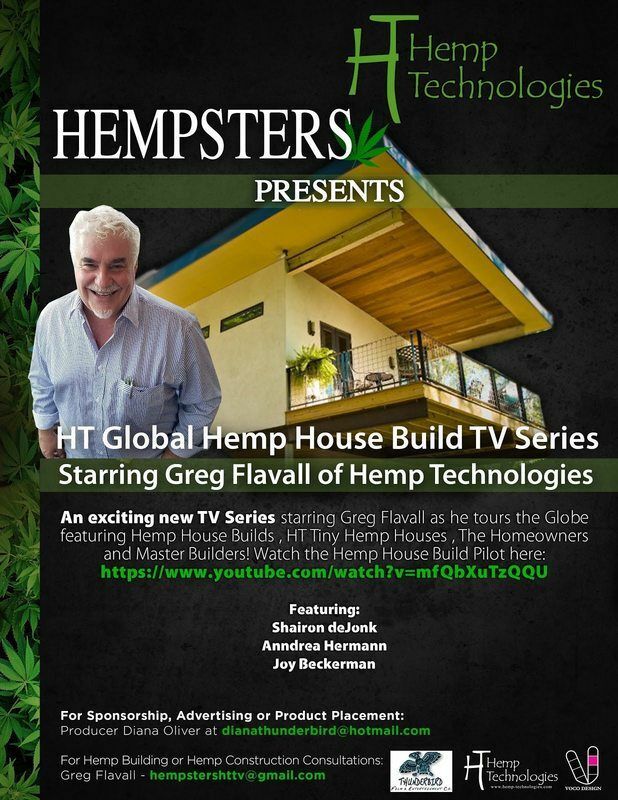 Poster for the upcoming TV show, “HT Global Hemp House Build TV Series,” from Hemp Technologies and Thunderbird Film & Entertainment Co..
Flavall and Oliver worked together on a pilot episode in 2011, along with Ervin Dargon of Mingo Video, but the sudden death of Flavall’s business partner, Dave Madera, from cancer, cut the initial phase of the project short. The first episode is dedicated to Madera. Last year, with Flavall once again building with hempcrete in the U.S., they decided to revive the show. The timing for a show like this seems perfect to Flavall, who said interest in hemp and hempcrete is booming. Even though he’s been legally building with hempcrete in the U.S. and elsewhere for almost a decade, he credits the current rising interest to the spread of marijuana legalization. Between the growth of green building, and widespread interest in “tiny homes,” Flavall believes hempcrete has a big future in the United States. We sit down with Diana Oliver, producer of the hemp documentary series Hempsters, to discuss her journey of covering hemp for 20 years and her upcoming docu-series with the Cannabis Car. 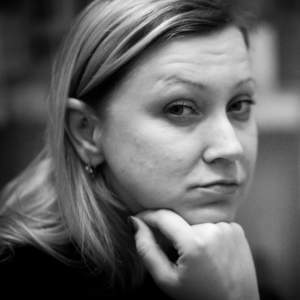 Diana Oliver is the Producer and Director of Thunderbird Productions, a full-service, independent film company, based in Dallas, Texas. 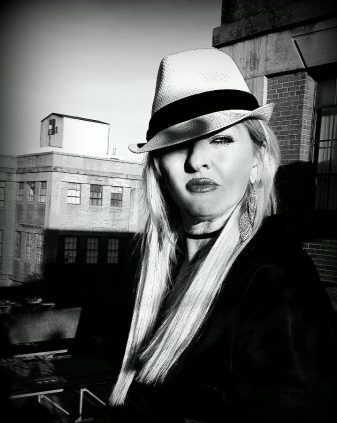 Diana has produced multiple documentaries on Industrial Hemp, and is most known for her work with Hempsters Plant the Seed, which has been awarded the Top 100 Documentaries of All Time by A Higher Perspective. Most recently, she has partnered up with Bruce Michael Dietzen, the founder of Renew Sports Cars that created the cannabis hemp car. During our discussion with Diana, we got the opportunity to learn about her passion for Hemp and what she hopes to accomplish through these Hemp Documentaries. Hi Diana. Reviewing your online profile, I was really impressed at all the work you’ve done to help the hemp movement. Could you share some background on how you got so passionate about hemp? Diana Oliver: I was an actress in LA and moved back to Dallas in ’94 to move from on camera to producing. I was sitting at my desk in Dallas at Media World Television, when an AP wire came across my computer that actor/activist Woody Harrelson had planted four feral Hemp seeds in a protest in Beattyville, KY. I knew a little about Industrial Hemp from a makeup artist friend, but did not realize what it could truly mean to the world. So I began researching that day, and became enamored with Hemp! I contacted Mr. Jack Herer, whom my first Hempsters film is dedicated to. Jack sent me The Emperor Wears No Clothes book. After reading that, I basically became obsessed with Hemp. The deforestation issue is paramount to me. One acre of hemp is equal to FOUR acres of deforested trees! The farmers’ plight, the US Economy, the environmental and social economic values in growing Hemp are limitless! I then reached out to Joe Hickey in Kentucky, who is Woody’s mentor and friend. We were invited to come to meet Woody in Kentucky and basically compete for the coveted filmmakers position. I reached out to a Dallas filmmaker, Director Michael Henning, and he came on board and off we went to Kentucky to meet with Woody and his team. Thankfully we were chosen to follow Woodys’ story and the rest is history, with the multi award winning debut film – Hempsters Plant the Seed. For those who have not seen the Hempsters documentary, what is it about? What is the message you were trying to tell with the documentary? DO: Hempsters Plant the Seed is a 14-year project about the fight to legalize industrial hemp in America for our US farmers, the Native Americans, and American citizens alike. We followed seven main activists: Woody Harrelson, The Graves Family, Julia Butterfly Hill, Craig Lee, Alex White Plume, Donna Cockrel, and Gatewood Gailbraith. Along with an additional 18 allies, including Willie Nelson, Merle Haggard, Ralph Nader, Stephen Jenkins of Third Eye Blind, Tom Cook, Joe American Horse, David Bronner, to name just a few of our Hempsters Heroes! What was the general feedback after the documentary was released and what were some of the major changes you’ve noticed since then? DO: The general feedback has been mixed, we caught a lot of flak during the making of the documentary about including Gatewood and his pro-marijuana rhetoric initially from Hemp groups, and I respect that. Back in 96′ when Woody risked his freedom to plant those revolutionary four feral Hemp seeds, we were all really fighting 80 years of misinformation, and actually attempting to change the laws in this country to grow Hemp. I realized about ten years ago that the marijuana movement was so organized, internationally, that groups like NORML were gaining huge momentum to legalize marijuana. In a sense, this also assisted in opening doors for Industrial Hemp, in my humble opinion, and the concentrated grass roots efforts of advocacy groups such as Vote Hemp, Hemp Industries Association & The National Hemp Association, and indeed Hemp farming is slowly gaining momentum, again, in the USA! During the past two decades, hemp legalization has made steady progress – but it’s been nowhere fast enough. What has been the biggest frustration working for this movement? DO: The list is too long! 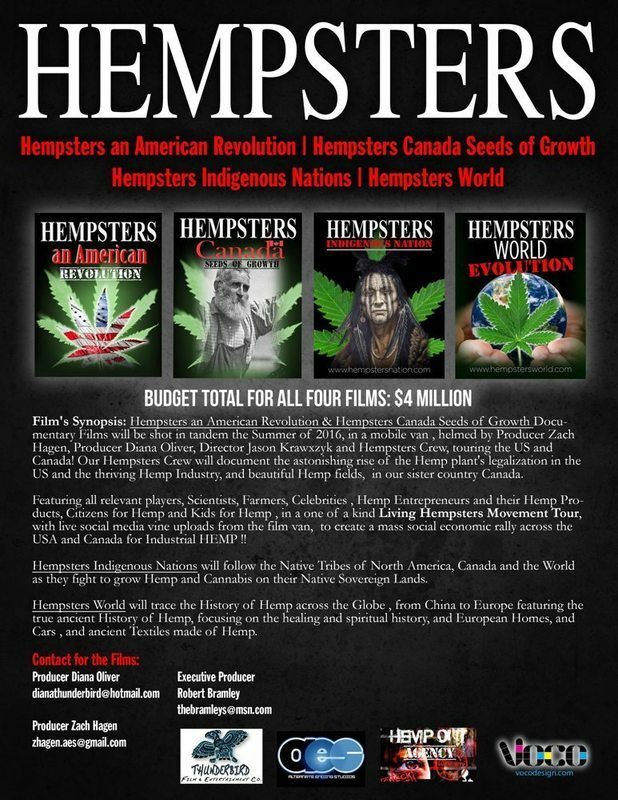 Hempsters Plant the Seed was a 14 year, chronologically filmed project. Woody’s story alone spanned 7 years – from his Hemp protest planting, his subsequent arrest, trial and acquittal. I’ve experienced so many blessings and roadblocks while working with such mega stars, but he is a true Hempsters’ Hero and inspiration of mine from day one. I formulated the entire first film around his protest planting. The losses I would have to say, have been the wonderful people we lost along the way, from Jack Herer, Donna Cockrel, Gatewood Gailbraith, David Madera, to some of my nearest and my dearest family. Any stories of when you were heavily discouraged? DO: Yes, mostly the naysayers, the “Hemp is a nickname for marijuana” jokes. But God, and my Family, my Mother Mary Oliver, Father Roy Oliver, my sisters Brenda and Lorna, and our investors have helped us along the way and assisted in keeping this Hemp filmmaking dream alive! My business partner, Geoffrey Green, has been crucial, along with investors, Roger Ford and Jesse Sayler of Patriot Bioenergy in Kentucky co-invested in Hempsters Cannabis Car and Bruce’s Tour. Their faith and belief in Industrial Hemp and my filmmaking outreach kept me in the fight! More recently, you have teamed up with Bruce from Renew Sports Cars to create a new docu-series based on his cannabis car. How did that come about? DO: Bruce and I met online on Facebook , right after he launched the cannabis car. He had met Aviva Vuvuzela and the Flying Penguins, an Atlanta based band, that wrote the first Cannabis Car Song. Aviva told Bruce about Hempsters Plant the Seed and my producer work. Initially, I was going to feature him in my second of seven Hempsters films, Hempsters an American Revolution & Hempsters Canada Seeds of Growth, which has been in funding mode for a few years, and now thankfully being funded by Executive Producer Robert Bramley. Bruce contacted me last summer about collaboration and producing his tour under my Hempsters Brand. At the same time he had also just been invited by Wendy Robbins and Karen Paull to be a contestant on The Marijuana Show in Denver, where he could pitch his Renew Sports Cars Company for one million dollars. That was all I needed to say yes. Because a million dollar pitch was going to get press, which translates to awareness for documentary filmmakers. Bruce and I partnered up on the Hempsters Cannabis Car Sustainability Tour Docu Series. The project is a docuseries film tour, traveling across the country to share Bruce’s Hero Journey and following in Henry Ford’s non carbon footsteps in the Cannabis Hemp Car! While in Denver, I contacted The Denver Post to do a feature on Bruce as a contestant on The Marijuana Show and it paid off big time! The Denver Post led to a video feature in the Denver Post Online, this led to The New York Post, ABC, NBC, CBS, PBS, and the momentum continued to build from city to city. I then approached the amazing team at High Times, whereupon we were featured in the May/June 2016 Ballers’ Buyers Guide. The High Times article triggered Barcroft Media (and international Media giant) and a current feature on Barcroft Cars You Tube Channel. Our message of Hemp cars is going viral! All the press momentum really helped The Hempsters Cannabis Car tour to jumpstart our awareness tour. On the production side, I raised $30k last year with our first investors from Patriot Bioenergy, and that’s when we were off and running with our film crew and Bruce’s Hero’s Journey. We followed Willie Nelson’s Tour from Farm Aid 30 in Chicago to the Marijuana Show in Denver, where Bruce and The Cannabis Car were contestants. From there we headed to Pikeville to have the Cannabis Hemp Car parked in front of Willie and Merle’s final concert in Kentucky. We also filmed on Brushy Mountain an homage to Woody Harrelson’s 20-year Hemp Seed Planting Anniversary in ‘96, which is featured in Hempsters Plant the Seed. Overall, it has been s a lot of Hemp synergy all around! You can watch both the Sizzle and the Trailer for The Cannabis Car Tour on our Facebook page: Hempsters Cannabis Car Tour, which is currently being shopped for Network Distribution. What are you hoping to accomplish through the upcoming documentaries that might be different from the original Hempsters documentary? DO: Hempsters Plant the Seed chronologically followed the fight to legalize industrial Hemp. Now that a few states have legalized it, while the educational fight rages on , now we want to focus on Hemp products, like Hemp cars. When people can see, feel, drive, touch, taste hemp, and wear hemp, this will bring the much needed awareness to the maligned plant. When is the documentary series projected to be released? DO: The Hempsters debut film is Hempsters Plant the Seed, and this is already available on Apple TV, Amazon, iTunes, Hulu, Netflix, You Tube, Free Speech TV, etc. 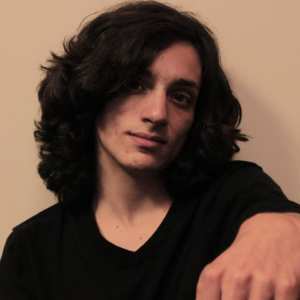 The second and third of the films in our series, which are being produced in conjunction with award winning filmmakers Zach Hagen and Jason Krawczyk of Alternate Ending Studios, are slated to shoot over a two-year period. The first in the series will launch this summer in a film tour and are being shot in tandem this summer on a six-week 27 US states & 9 Canadian provinces tour. Currently there are 9 films total under the Hempsters brand and our goal is to also launch a Hempsters Network Channel, which is in discussions now. The Hempsters Network Channel will focus on all environmental films, hemp & marijuana related films, and documentaries that fight for our environment. How could our readers find/watch them? DO: Each film has its own Facebook page, and upcoming website. I’d ask for the readers to search Facebook under Hempsters and the titles listed above. We have call to action buttons and are launching the Hempsters Docfilm Series Apps via Google Play this month as well. Thank you! What type of legacy would you like to leave behind? DO: Hopefully one of an activist, a humanitarian, a truth-seeking filmmaker, an educator – all via the Hempsters documentary/film series. Our focus as filmmakers is to educate the masses about the most misunderstood and outlawed plant in US History, and to offer Industrial Hemp as an organic and viable option to the over polluted and highly toxic society that we live in today. Everything in our society can be naturally resourced, and plant-based. Just think what our world would be like if Henry Ford had mass manufactured the Soybean/Flax/Hemp car? DO: Hmmm, tons of them, but definitely when Jack Herer presented me with a signed copy of The Emperor Wears No Clothes then attended a Santa Monica Film Festival screening of Hempsters Plant the Seed. He hugged me and said he was proud of my work. Again when I went backstage at a Willie Nelson benefit to deliver Willie with his copy of the film and he hugged me and said the same! I also think about when we won ‘Best Work In Progress’ at the Deep Ellum Film Festival and my Daddy and Mama said how proud they were of me. I am not in this for accolades, I will leave that to the celebrities, the farmers, the Hemp car makers, the Hemp companies and the Hemp plant! I am in this to educate and entertain, and open people’s hearts and minds about this most impressive beautiful Hemp plant. Thank you so much for your time. Is there anything else you’d like our readers to know? Also, please vote for hemp in your state at www.votehemp.com. Hempsters, The Time for Hemp is NOW! Thank you and God bless you Hempsters! Hemp, the non-psychoactive strains of the Cannabis family, was once one of the most ubiquitous plants in the world. First found around 8,000 BCE in central Asia, hemp spread across multiple continents through the ages and was a fundamental part of the agricultural revolution. Throughout several civilizations, hemp was used for food, textiles, oil, and industrial purposes. Yet, after getting confused with marijuana in the 1900s, hemp was soon outlawed and forgotten. Many of its benefits were lost in the modern world. 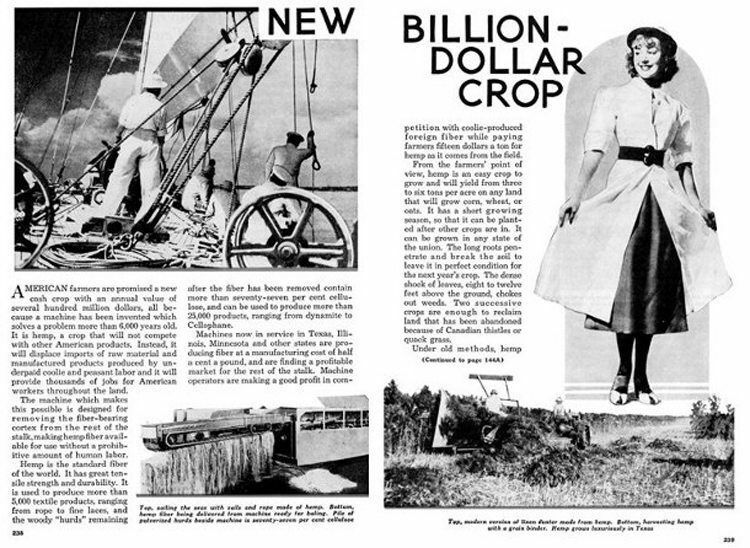 Popular Mechanics published an article back in 1941 with findings that hemp “can be used to produce more than 25,000 products”. In several other countries, hemp has continued to be used for food, textiles, and even in construction to build houses that are more energy efficient than regular buildings. The best part of hemp is that its applications are completely eco-friendly and sustainable. 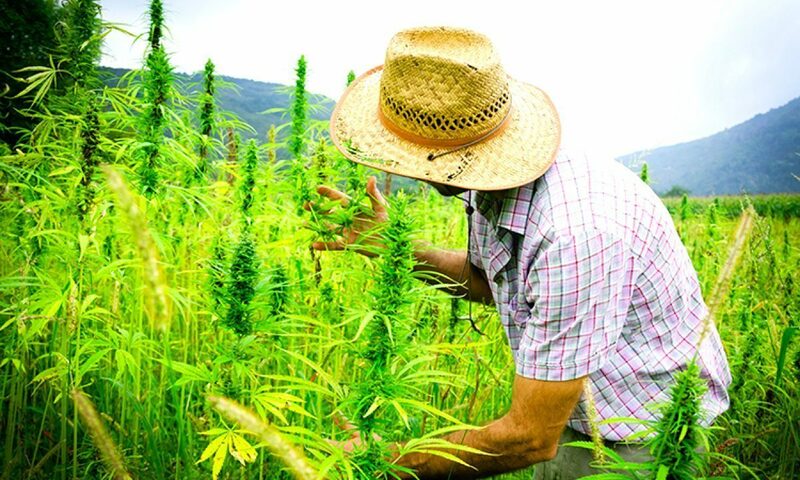 Farmers can actually restore the health of their farmland by planting hemp as it eliminates the need to use agrochemicals such as herbicides or pesticides. Since hemp grows so densely and its roots are so deep, it kills off weeds naturally. Planting hemp can offer an alternative solution to many of our current practices that are damaging this planet. With a growing cycle of only 4–6 months, hemp is a more sustainable option than trees for paper. Anything you can make out of fossil fuel, you can make out of hemp. This includes energy, plastic, or any other petroleum based products. Hemp has too many applications for us to ignore, especially as we fight an uphill battle against climate change. Bringing hemp back could be key to our sustainability efforts in preserving our soil and natural resources. Developing different applications of hemp and spreading it to the mainstream will help increase the supply of hemp and jumpstart a shift to a healthier society. We encourage you to learn more about the benefits and uses of hemp by getting involved with hemp events in your city. This is a fantastic way to meet hemp enthusiasts in your community, while helping to grow hemp awareness. You can also support the hemp movement by writing to your legislators. Ask them to support the Industrial Hemp Farming Act to legalize hemp allow our farmers to grow this crop. 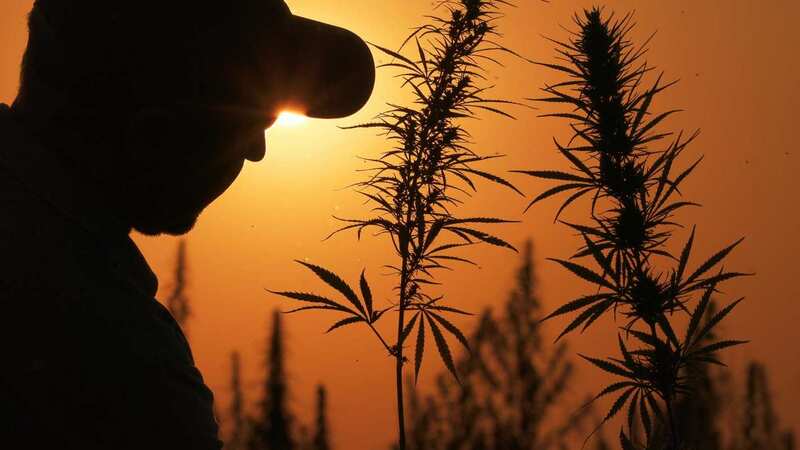 Zev Paiss, the founder of the National Hemp Association, claims “The Industrial Hemp Farming Act could be the largest jobs bill that Congress can pass in 2016”. Help us get the American agriculture back on track.